Politicians Refusing to Swear on the Bible, Are We a Christian Nation or Not? With Politicians Now Refusing to Swear on the Bible, Are We a Christian Nation or Not? 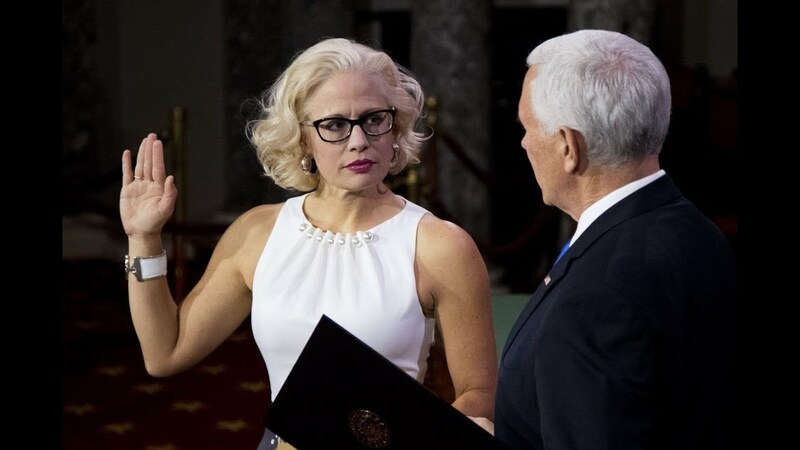 On January 3 of this year, Senator Kyrsten Sinema of Arizona stood before the Vice President and swore to faithfully discharge the duties of her office. With her right hand raised, she placed her left hand on the text she most revered—a copy of the Constitution. Well, for some people, quite a bit. Traditionally, elected senators and other political leaders swear on the Bible. Yet Senator Sinema opted for a book from the Library of Congress that contains both the Arizona and U.S. Constitutions, as she “always does,” her spokesperson told the media. Sinema is also the only person in Congress to declare herself as “religiously unaffiliated,” according to the Pew Research Center for Religion & Public Life. Add the fact that Sinema openly identifies as bisexual, and you have yourself a controversy. Of course, the argument seething beneath all of this a very old one, hinging on the question of whether America was, at the outset, a Christian nation. Was it? It really depends on who you ask. It also depends on what you want to believe. See, that’s the thing about history: quite often, you see what you want to see. Historian John Fea notes that it’s common for Christians to approach history with a kind of “present-mindedness,” cherry-picking evidence that confirms their presuppositions and ignoring the rest. The same can certainly be said for the other side. If you want to ignore Christianity’s role in America’s founding and find evidence to the contrary, you certainly can. It all depends on what you choose to look at. History, however, real history, is far messier than either side would like to admit. Was America founded as a Christian nation? Well…that’s a tricky one. History should humble us. For instance, Christians, what if we took this opportunity, not to rage against a bisexual nonbelieving woman who refuses to swear on the Bible, but to consider: what if the reason Senator Sinema doesn’t want to swear on the Bible has everything to do with how it’s been wielded? But is that true? Is the Constitution godless? Or is it a direct product of the Bible? If we really look at history and take all of the evidence into account, I think that both sides will ultimately be disappointed by what they find. Christians will discover that there’s a lot more secular thought swirling around the founding of America than they would prefer. And those who think American ideals can be separated from God will find that it can’t be done. Real history won’t give us the easy answers we want. Which is good, I think. History should humble us. For instance, Christians, what if we took this opportunity, not to rage against a bisexual nonbelieving woman who refuses to swear on the Bible, but to consider: what if the reason Senator Sinema doesn’t want to swear on the Bible has everything to do with how it’s been wielded? The Constitution is rooted on Biblical principles, sure—to pretend otherwise is to “distort our understanding of the nation’s constitutional experiment,” as Daniel Dreisbach contends—but how often has the Bible been used to support other, less noble causes? How often has Scripture been used to oppress homosexuals or justify slavery or promote hatred? Maybe we should be less concerned with the Bible influence on the Consitution and more concerned with how well we are representing the truth of Scripture to the world. Perhaps, through our radical love and lives, we can show America that the Bible is a book worth swearing on.